A fascinating and compelling film about the time of Stazi in East Berlin, right before the wall came down. A great movie, this film is frightening and tense with it’s German government and their hunt for traitors to their system. The movie is about the Stasi, a secret underground German police force during the time of the Berlin Wall. Nobody is allowed to leave East Germany and the Stasi is not only investigating those who escaped and where their help came from, but also which authors are writing in support of western ideas. There is a lot of blacklisting and imprisonment going on, and the story is about a main character, named Dreyfus, who is caught in between. He has friends who have been blacklisted and see the Stasi as a terrible force, corrupting the city, only it appeas that there is very litttle e can do about it. The movie becomes about Dreyfus taking a stand and the results that come from it. It’s very powerful and compelling. 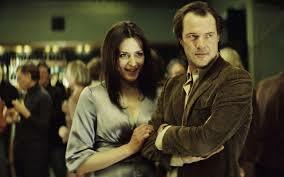 The Lives of Others is one of two German movies made from the same time (2006-2007) that really became known as a terrific film among the foreign-independent film world. The other movie was The Black Book. These movies went on to become very popular and acclaimed, and The Lives of Others in particular won the Accademy Award for best foreign movie of that year. It was well-deserved. The movie rides the lines of drama, suspense, and even romance. It is set in the historical time period of the 1980s when the Berlin Wall was still up and the Stasi was an underground East German organization that was given their power by the government. It was sort of an underground policing unit, where interrogation and imprisonment were their weapons. The Stasi ran wiretaps on whoever they pleased. As told to us in the opening titles to the film, their goal was to “know everything.” It was sort of a mix between the Nazis and the Red Scare in America during the time of Joseph McCarthy and Communism. If people were found to be pro-west or helping others escape to the west, they were either imprisoned or blacklisted, and never allowed to work again. The movie opens with one of these interrogations. Germany, at the time of the movie, was known as the GDR (German Democratic Republic), and the interrogator is an older man named Weisler. Another man is brough in to sit down and meet with him, and Weisler begins asking questions about this man’s friend who escaped to West Germany. The man, of course, says that he knew nothing about it. That’s when we abruptly cut to a classroom where Weisler is teaching students and together they are listening to the tape of the interrogation. He teaches them some important lessons and tricks to pay attention to. First, Weisler tells them, if someone is innocent than the longer you hold them there, the angrier they get. But if they are guilty, then they get tired and fall asleep. Second, someone who is innocent repeats the same story in different words. Someone who is guilty has planned out his story and exactly how he will tell it, and so he uses the exact same words again and again. Finally, Weisler tells the students why, during the interrogation, he keeps insisting that the suspect put his hands under the seat cushion. On each cushion there is a cloth. When the suspect leaves the room, the cloth is removed and placed in a jar to be used as an odor sample for dogs, should the case come up in the future where they need to track this person down. All of that is just the introduction. It gives us a firm grounding of the tricks that the Stazi uses, and how smart this movie just might be. It also introduces us to both Weisler and his commanding officer who has invited him to go to a play that night. The play is when all of the main characters come in. There’s Weisler and his commanding officer, but then there’s also the Minister, who is in charge of the Stasi, watching from the best seats in the house. Weisler and his commanding officer watch and discuss the writer of the play, a man named Dreyman. The former director of the play, a man named Albert Jerska, has been blacklisted and is no longer working. Weisler suggests that they start watching Dreyman. The Commanding Officer doesn’t agree until he hears the same idea from the Minister too. As it happens, the Minister has personal reasons for wanting Dreyman watched. He is having an affair with Dreyman’s girlfriend, Maria Christina, who is an actress in the play. He wants the Stasi to find something on Dreyman so that they can lock him away. We meet Albert Jerska, as Dreyman first speaks to the Minister about his friend, and then relays the conversation to Jerska, offering him a sign of hope. We also watch as Weisler goes into Dreyman’s home with a team of agents and bugs the entire place. When they are noticed by the woman across the hall, Weisler personally pays her a visit to threaten her against saying anything. The big event that pushes everything in the storyline forward, from about the halfway point of the film on, is that Jerska commits suicide. This prompts Dreyman to write an article for a magazine about the suicide rate under the Stasi and how it is the second to highest here in Germany, compared to the rest of the world. Once that article gets written, the Stasi finds out and takes it very seriously. They don’t know who wrote it, but they want the author found and arrested for treason. This is where the interrogations of our main characters begin. Weisler has been listening to every conversation that took place in Dreyman’s place, which is the central location where he and his friends gather to discuss their plans. I like the way they don’t just assume that the place is safe from bugs and wiretaps, and instead give it a test by making up a story about a friend of theirs escaping, to see if anyone is listening. When it seems that the place is clean, they continue. The friends bring Dreyman a typewriter to type his articles, and he keeps it hidden under the floorboards. But Maris Christina is brought in for questioning. She has been purchasing illegal drugs and the Stasi have her right where they want her. She is thrown through the ringer with the interrogations and held at the prison until she speaks about what she knows. The movie takes some interesting turns from here. It might seem like Dreyman is out of luck, and that the Stasi is on his case, but things have a very clever way of working themselves out. The Lives of Others is one of those movies that you really want to put together, like a mystery, taking in every character name and examining it like a clue. The second half far exceeds the first half of the movie, and that’s because the first half was all build-up to make the second half possible. Still, this is the kind of movie you go back and watch again, after seeing the ending, and now actually knowing who the characters are in the grand scheme of things. It’s a movie that definitely gets better after more than one viewing, because that’s when the pieces start coming together. The result is a pretty special and suspenseful film.